SAN MATEO, Calif. — September 29, 2015 — SnapLogic, an industry leader in enterprise integration platform as a service (iPaaS), today announced new capabilities for delivering application and data integration for Microsoft Cortana Analytics Suite. The SnapLogic Elastic Integration Platform enables customers to get to business insights faster by providing self-service data ingestion, preparation and delivery from virtually any source – whether on-premises, in the cloud or in hybrid environments – to the Cortana Analytics Suite. Pre-built intelligent connectors – called Snaps – for Microsoft Azure SQL Data Warehouse, Microsoft Azure SQL Database, and Microsoft Azure Blob Storage. These Snaps provide fast, self-service data connectivity to and from Cortana Analytics and other Azure data services. The ability to deploy SnapLogic’s hybrid execution framework – called an Azureplex – on Microsoft Azure with and within Azure HDInsight for fast, scalable big data analytics. 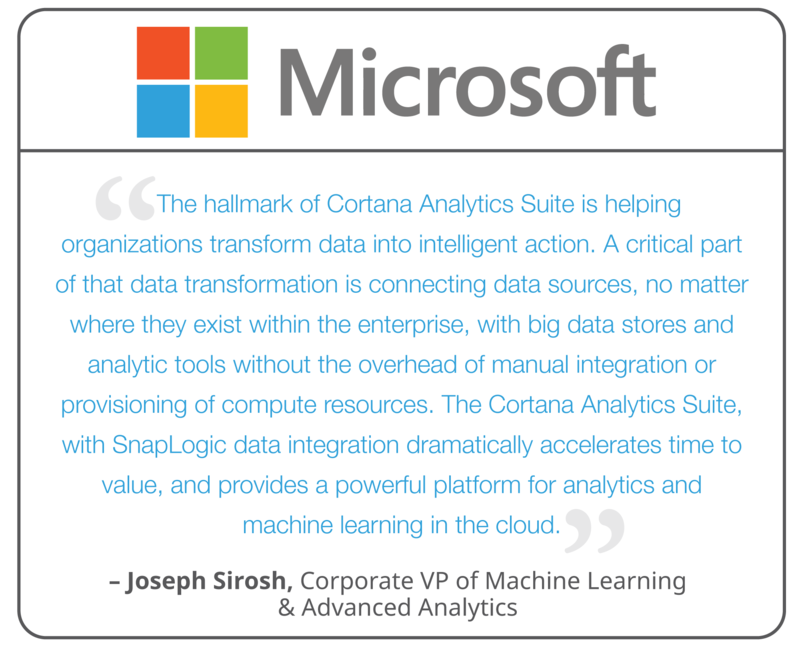 The first of SnapLogic’s integrations for Microsoft Cortana Analytics Suite are available today. For more information visit www.SnapLogic.com/Microsoft-Azure. SnapLogic is the industry’s first unified data and application integration platform as a service (iPaaS). The SnapLogic Elastic Integration Platform enables enterprises to connect to any source, at any speed, anywhere — whether on premises, in the cloud or in hybrid environments. The easy-to-use platform empowers self-service integrators, eliminates information silos, and provides a smooth onramp to big data. Founded by data industry veteran Gaurav Dhillon and backed by leading venture investors Andreessen Horowitz and Ignition Partners, SnapLogic is helping companies across the Global 2000 to connect faster.